This website is made to inspire breeder farmers, hatchery staff and broiler farmers to improve hatchability, chick quality and performance. 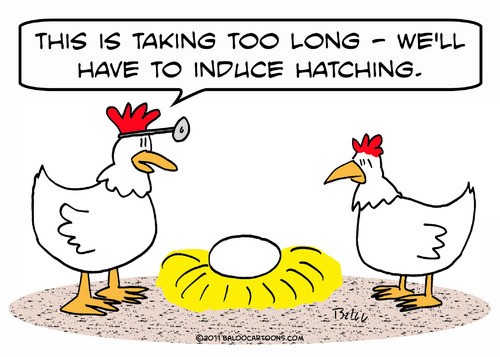 A better understanding of the incubation process ultimately will lead to better care of the hatching eggs, higher hatchability and better chick quality. Even more important, paying attention to egg quality, any improvement in the incubation process and rearing conditions will pay out immediately. Hatchability.com serves as a bridge between incubation science and hatchery practise. You need the best team in the hatchery! Today there are no really bad single stage incubators on the market. It is far more important to invest in your hatchery staff to learn them how to work with your eggs and incubators to be able to hatch high numbers of good quality chicks. And to keep your customers happy. On this website you find the best information for free, selected for you after years of practical hatchery research. So much is written about egg incubation, but not so many papers can be used to improve production results. You can take the long route and look up everything yourself, or take the short route and wander through this website and train your staff yourself, or for example invite me to organise a HatchCheck, or for an on-site / on-line training at your place. A perfect opportunity for you to support your staff and help your customers as well with better chick quality, less troubles and higher profits! A high number of fertile eggs is the result of a good rearing period. Uniformity in the development of organs and glands is by far more important than having a uniform body weight profile. This can only be achieved by a good understanding of breeding biology of males and females during rearing, and to provide the right type of feed and optimum circumstances during the specific phases in rearing. Overfeeding or under feeding may easily occur and have a huge impact on organ development and future peak and persistency in egg production. 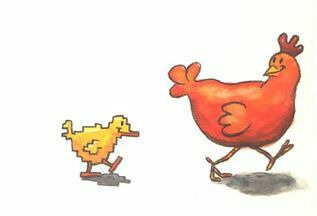 When finally good quality chicks have hatched, it is of great importance to transport them gently to the broiler or rearing house. Again, all environmental conditions during transport and in the broiler or rearing house need to match the requirements that the young chicks have. Innovative rearing systems as Patio or Hatchbrood / Hatchcare aim to take care of the young chicks. Basic principles however are the same as in traditional broiler houses. See the section chick quality The incubation process and the first week broiler house conditions are of great influence on broiler performance. Growth, breast meat yield, feed conversion ratio, gut health, feet quality are all be improved by incubation conditions. To minimise broiler mortality, enterococ infections in femurs and bone marrow, E-coli infections and slaughter house condemnations, think of incubation quality and first week housing conditions first! 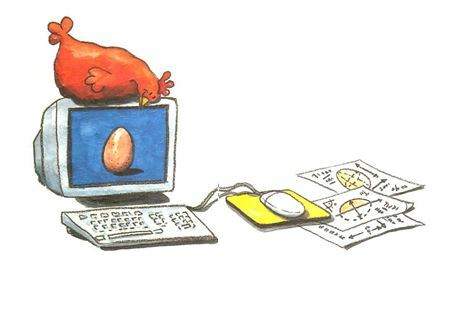 The incubation process plays a very important role when you want to optimise technical and financial results in your hatchery or in your poultry integration! 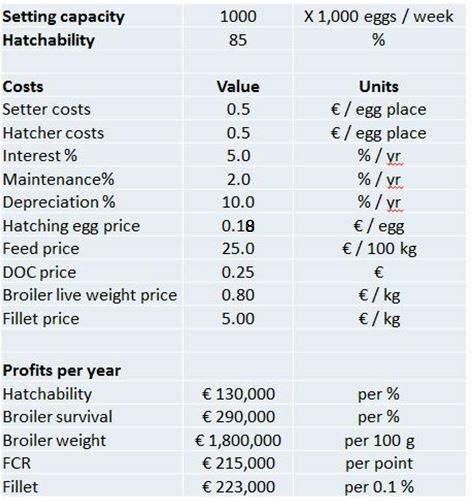 Not only hatchability will be increased, also chick quality, chick survival, broiler growth, feed conversion AND slaughter yield will be better! This makes incubation not a cost center to your organisation, but a profit center. Each small improvement in incubation conditions will improve your technical and financial results, which may reach over millions €€€ per year. You can make your own calulations using the "cost & profits download" on the downloads page. The setting capacity of the hatchery is 1 million eggs per week. On average, hatchability is 85%, broiler mortality is 3,5%, body weight at 40d is 2,0 kg, feed conversion ratio is 1,6, and breast meat yield is 20,0%. It can be seen that small improvements in incubation conditions can yield large profits in the broiler value chain. To support people who are amazed by the wonderful world of incubation and who want to get a better grip on hatchability and chick quality, Hatchability.com will respond to any questions as soon as possible. Relevant literature is free on request. Hatchability.com bridges the gap between theory and practise, and provides in seminars, lectures, and on-line / on-site consultancy to the poultry industry world wide. Hatchability.com has proven skills in trouble shooting and production improvement, and look forward to assist you and your company as well. Follow updates on Facebook or Linkedin!